Panjin Red Beach is the world's largest wetland. Situated off an estuary in Liaoning, North-Eastern China. Saline conditions on the coast are perfect for seep weed, a plant that turns red as it matures in autumn. As a result, some 51 square miles of the area turns a stunning crimson colour attracting many tourists. A beach off an estuary in Liaoning North-Eastern China, has transformed from a lush green to a crimson red with the arrival of autumn. 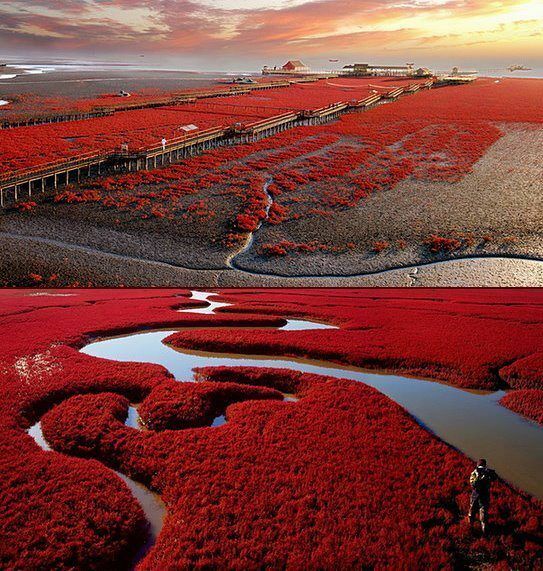 A jetty has been built over the red marshland to allow tourists to walk over the red beach. Autumn is particularly popular for visitors. There is nothing but red for miles around, as the land is very flat and densely populated with for miles around as the land is very flat and densely populated with the plant, many dubbed it "Red Carpet Beach". The location of the beach on the coast means the soil is incredibly saline, which is the perfect condition for sweep weed to thrive. In contrast, other plants cannot survive because the salt levels in the soil are too high. This helps sweep weed to dominate the beach. The unusual sight is as a result of the seep weed, which grows on the coast. It matures from green to red and finally purple in autumn. Seepweed, needs no tending and grows naturally along the coast. Panjin Red Beach, an incredible 51 square miles, is covered with it.